Frustrated commuters will get direct access to Transport Minister Lord Adonis when he embarks upon a six-day rail voyage across Britain. The minister will board the Paddington to Truro sleeper on Easter Monday - armed with his laptop and a standard class Rail Rover ticket. On Saturday he will reach York after a 2,200-mile trip taking him as far north as Inverness. Lord Adonis said he wanted "first-hand experience" of the rail service. He told the BBC the trip was "deadly serious" and not just a publicity exercise. He said: "I think it's very important for ministers who are in charge of public services to really experience intensively the public services they are responsible for. "I don't think you can be a good transport minister unless you really do understand instinctively how the transport system works. "My plan is to get to railway lines I have rarely or never used." The minister's journey will involve some 45 trains. He added that when on official business he travels first class, but on all other occasions he uses standard class. Lord Adonis also said that if trains were too crowded to find a seat, he would have to stand along with other passengers. He said: "I won't have any alternative if I get on a train and it's full, that's what I'll have to do. "But it's good for me to get these experiences and of course the government is doing a lot about them." After leaving Paddington, he hopes to speed through Cornwall, East Anglia, the West Midlands and on to Aberdeen, before arriving in North Yorkshire. Any signs of cabin fever will be logged on a Times Online blog. A spokesman said: "Andrew is travelling solo and is happy for commuters to chat to him." 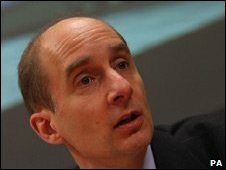 Lord Adonis was appointed minister of state for transport in October 2008, having served over three years at the then Department for Education and Skills. In January the government announced plans for a new high-speed line, which will run between London and the West Midlands, and possibly on to Scotland. Dawning of rail's new golden age? Is this the new age of the train?